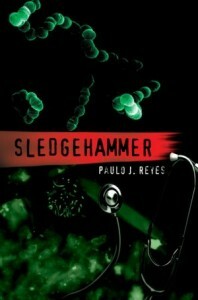 Sledgehammer : Looking for a good fiction book to read? Look no further. This medical thriller will have you glued to every page as the drama unfolds and an ER doctor must stop a biochemical nightmare from happening. 6 days … 6 days to stop an epidemic and convince the government that terrorists have indeed used smallpox as a weapon against us. When one of the terrorists shows up in the ER with symptoms, time is of the essence to convince higher ups and the government that indeed this is the dreaded once thought eradicated disease smallpox. If not for the quick action and prior medical expertise of the main character, Dr. Max Kroose, fatalities could be in the millions. What makes the book even more interesting is that the events unfolding in the ER symbolize real events that occur in emergency rooms daily. The author, Dr. Paulo J. Reyes, is a practicing Emergency Room Doctor and First Responder to disasters in Los Angeles, California with a medical career spanning 25 years. His medical expertise helped to create a medical environment that medical personnel, fans of medical TV dramas, as well as all science fiction fans will enjoy. Added to that, the characters are well developed and passionate in their quest for answers. Although the book is fictional, it’s based on extensive research and leaves you questioning-could it happen today? With today’s ongoing terrorists’ threats, the growing concern of a biochemical attack, and the fear of a global pandemic, this book shows you how situations like this would be handled. Would the government be prepared? Do we have enough vaccinations for everyone? Should we have voluntary vaccinations now? Questions you will want answers for. 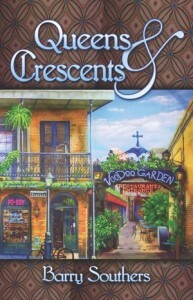 Queens And Crescents : What certainly stood out for me in Barry Southers novel, Queens and Crescents, was his strong and deep feelings for his family that Barry made apparent in the dedication for this book. The love and appreciation he shares here is actually quite touching. The introduction does a good job of setting up the book through a discussion of happiness and success in today’s society. Readers will find plenty of action and suspense in this murder romance novel. The main character here is Sean Martinez, a 28-year-old divorcee who works a mundane position in a mortgage broker firm. For Sean, life is just one day blending into the next. He just could not get over his wife leaving three years ago with her old lover. If there were a need for an example of a man in dire need of a vacation, Sean would be chosen. Spurred on by a radio commercial one excruciatingly hot day, Sean’s vacation destination is decided for him. There, he finds true love, fascinating passion and discovers the power of intuition and fate. Cruel crime lords fighting for position, bloodcurdling hired killers and a heavy loss bring Sean back into living life for what it is.